Review: Victor Hugo’s magnificent literary work, “Les Miserables”, is once more adapted into cinema, but this time as a musical drama. Directed by the talented Tom Hooper (“The Damned United”, “The King’s Speech”), this big production didn’t have practically any impact on me. The musical side simply didn’t work, with most of the songs being presented in the same melancholic mood, while the emotions didn’t surfaced, remaining hidden behind the exacerbated revolutionary chants or the deep laments of love and regret. From the entire cast, only Sacha Baron Cohen and Helena Bonham Carter excelled, with the latter bringing into my mind Tim Burton’s dark musical “Sweeney Todd”. Regarding the outer scenarios, I wonder why these high-budget films tend to adopt an artificial appearance, looking more like paintings rather than reality. 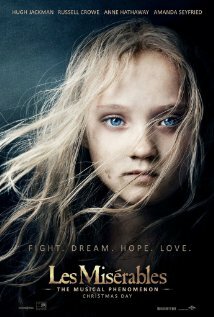 “Les Miserables” aimed too high and turned out on another unnecessary film. Don't disappoint me that films look like good paintings. I liked this film. Overall, its capability to emulate the epic scenes. Different opinions are always welcome! I believe that in a drama of this kind, the "paintings" don't make much sense. In movies such as "Life Of Pi", which invokes the fantastic, it works well, but not in this context. The images seemed too unreal and fabricated. Nevertheless, I didn't like the songs and the casting too. Typical trophybait movie, made to a gain Oscar Award and other trophy nominations. It is nominated for 8 Oscars.